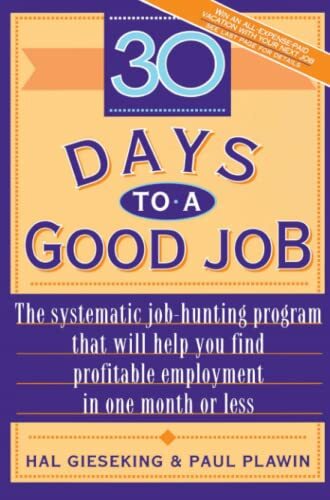 In what is the first really fresh job-hunting idea since What Color is Your Parachute?, 30 Days to a Good Job puts you on a strategic, systematic 30-day program that leaves you no time to become discouraged. This positive, highly focused program provides you with an accelerated schedule that reduces the conventional six- to twelve-month job search "sleepwalk" into a well thought out blitz that gets you not one but a half-dozen contacts in each of your prospective companies and up to 150 job contacts in a single month. -- How to arm yourself with the most effective self-marketing techniques to beat out the competition. -- How to use a highly structured 30-Day Job Planning Calendar, complete with specific assignments to perform daily. -- How to speed up your job search by employing Job Prospect Cards (listing company names and key decision-makers within the organization), Life Experience Cards (documenting work, education, and social experiences to help individualize resumes and cover letters), and a Contact Notebook (featuring pertinent information for follow-up letters and phone calls).